Illustrating every card in the pack was an idea of company Digital Abstracts. It originally started as a crowd funding campaign on KickStarter (where they were asking for about $5,100 and were given about $34,000) This project managed to get amazingly talented Designers and Illustrators from all around the world to contribute towards this venture. We have created Gif Animations for easier viewing and we listed all the Artists and their links below the image. 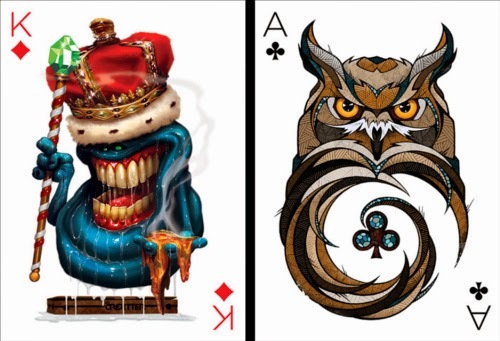 The cards are still for sale on their site, meanwhile you can enjoy the Art. Have you got a favourite? let us know in the comment section below the Article.